No Tommy, no portals. Got it? Human Head's upcoming shooter sequel merrily dispatches with the two most iconic elements of the 2006 first game, which has already caused quite a lot of grumbly consternation in Internet Town. Just wait, though, until you see where the developers have taken the game instead of revisiting its past. Prey 2 is not, for the most part, another game about shooting monsters in corridors. Despite its genre-shifting, rest assured that it remains a direct sequel to the first game's tale of nasty aliens invading Earth, but it is absolutely determined to expand the story rather than retread it. Mildly controversially taking the place of Prey 1's Native American star Tommy Tawodi is the oddly-named Killian Samuels (who's Ian, and why does he have to be killed? ), an all-American Air Marshall involved in a plane crash caused by the events of the first game. He – and you – have very little idea what went on between said crash and the situation in which he finds himself for Prey 2. Suddenly it's several years later, he's on an alien planet known as Exodus and he's a bounty hunter. Eh? All change, then. For the better, though, it would seem. 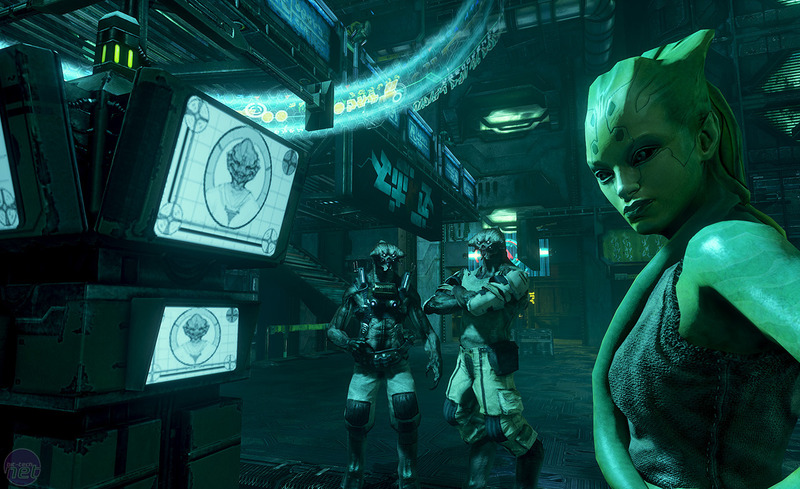 Exodus is the clear star of Prey 2's show. It's not a warzone or a glorified dungeon - it's inhabited, civilised and spotted with working cities. In stark contrast to the murderousness of Prey 1's snarling killers, this is a place where multiple alien races live together in something approaching harmony, although Killian appears to be the only human. He isn't, of course: the first game's dangling plot threads concerning Tommy will be resolved, with the fellow due to play a major role despite not being the star. Killian, meanwhile, is not your standard FPS hero. He's a bounty hunter. That means his tale is not one of travelling from A to B and murdering everything en route. That means he has to find and complete contracts. That means, astonishingly, that Prey 2 is an open-world game. Developer Human Head repeatedly name-checks Red Dead Redemption as an influence, but there seems to be more than a little Deus Ex, Far Cry 2 and STALKER in the mix too. This is good; fantastic even. The devs had the option to make another run'n'gun game, another mindless animal for the infinite herd, but instead they've raised their ambition much higher. The only area of Exodus on show so far is the Bowery; a seedy future-city clearly designed by people who've watched Blade Runner a million times. It has Hover-cars, towering techno skyscrapers, darkness and neon in an uneasy alliance, crimelords, murderers, strip clubs and so on. It's a familiar dystopia perhaps, but it's also a world to explore, rather than a tunnel-like slice of a world.